630 pages | 435 B/W Illus. Global climate change, increasing pollution, and continued rapid population growth is wreaking havoc on the planet. Stabilizing the environment at safe levels requires a large-scale restoration of damaged ecosystems. Geotherapy: Innovative Methods of Soil Fertility Restoration, Carbon Sequestration, and Reversing CO2 Increase outlines the basic concepts of geotherapy and highlights the importance of healing the biosphere’s ability to store soil carbon to prevent climate change impacts. Facing challenges head on, it addresses how and why policymakers have underestimated the long-term impacts of climate change and how we can correct the flawed carbon management mechanisms today. The book also factors in where carbon can be most effectively stored, how quickly that can be done, and the practical and policy actions needed to get there. This text presents innovative new technologies for restoring the most productive ecosystems on land while maintaining high biodiversity. It addresses processes and techniques of soil carbon restoration through biogeochemical cycling, biochar, slow-release fertilizers, weathering of minerals (olivine) and rock (basalt) powders, amendments and bio-fertilizers, and the establishment of vetiver and other perennials. Written by highly recognized professionals from every continent except Antarctica, this extensive work consists of 34 chapters covering issues that include: field experiences with biochar including a history of its research; practical uses of biochar in farming systems and the use of biochar for soil fertility enhancement; the potential of remineralization as a global movement; seawater concentrate for abundant agriculture; superior food production using sea salt and plant extracts; recycling waste nutrients using biochar and limestone; and commercially viable carbon farming. The book concludes with a chapter providing general thoughts on regreening the earth and averting a global crisis. 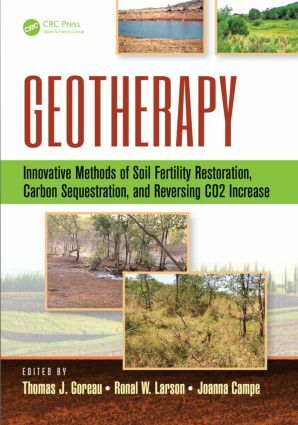 Geotherapy: Innovative Methods of Soil Fertility Restoration, Carbon Sequestration, and Reversing CO2 Increase is an encyclopedia of ideas providing the tools needed for anyone involved with the ecological restoration and transformation of the planet. "… a timely book that describes methods for soil fertility restoration and carbon sequestration in a manner accessible to general readers. … Authors from diverse backgrounds have contributed chapters, including academics, activists, and industry representatives from around the globe. Summing Up: Optional. Lower-division undergraduates through professionals/practitioners." This book, Geotherapy, with its multiplicity of perspectives focuses on three fundamental issues; healing the planet, stabilizing climate and feeding the human community. All are linked and interwoven in a story that begins with the soil and its stewardship and extends outward to encompass the whole planet…. The chapters that follow represent the unfolding of a new paradigm that is deeply rooted in the teachings of nature. … If the ideas laid out in Geotherapy were implemented, the capacity of the land to support economic activity would also diversify and expand…. It could also engage a large percentage of the people around the world. Our future as a civilization may depend on returning to our roots and the mineral as well as the organic materials that sustain them…. Geotherapy is an encyclopedia of ideas and tools for transforming the planet. The book is written by genuine earth stewards, most of who have field experience and a broad theoretical knowledge of the larger workings of the planet. Their experience spans many different climates, soils and cultures. This practical, get your hands-in-the soil manual is a good place to start to transform the world. That "carbon sequestration in soil being a win-win option" is the common thread that links all 34 chapters of the Geotherapy into a coherent and informative book. … Geotherapy supports the truism that "If soils are not restored, crops will fail even if rains do not; hunger will perpetuate even with emphasis on biotechnology and genetically modified crops; civil strife and political instability will plague the developing world even with sermons on human rights and democratic ideals; and humanity will suffer even with great scientific strides. Political stability and global peace are threatened because of soil degradation, food insecurity, and desperateness. The time to act is now" (Lal, Science, 2008).